I've been playing with blocks and finished another baby quilt. I'll show that one Friday. Used up about a half yard in those blocks. On the upper right of the DW are two new blocks for our Guild's BOM. I really need to get a bigger design wall - 36 by 44 just doesn't do it. 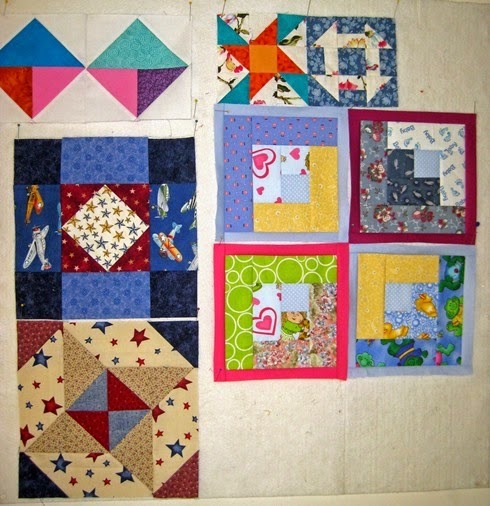 On the bottom left are two blocks I'm trying out for a new VA quilt I want to make. If it works out, I'll make a bigger one for QOV. Hope to use up two big bag os scraps on that one. Now tell me - how do you count your yardage when you are using scraps? Do you measure what is made and turn that into yardage? For instance - the two VA blocks measure 12 1/2 inches square or 156 square inches. A yard (assuming it is 36 by 42) has 1512 square inches. So that one block used up 10% of a yard - made 2 - so that's 20%, but I used a lot up in cutting mistakes, changes made to the blocks, etc - so say 40%. Then 10 for the small ones - a half yard. Gessh - all that work and used only a half yard. I'd like to hear how you calculate it. I'm linking to Judy's Design Wall Monday and Lyn's BOMs Away. See you there. Great blocks on your wall. Of course, my favorite is the bottom left. I'm afraid I don't calculate how much fabric I use. I generally try to cut as efficiently as possible (particularly when it is a fabric I love) so that I don't waste any of it! When the scraps get down to around 1 1/2" they go into a bag to be used to make little nine patches! Angie your design wall is so colorful and happy! It would certainly inspire me!!! Unless I need to know, I don't calculate. You sure have a lot of projects in the works to keep you busy!! Gosh, I don't know! I think I would figure it the way you just did. It was used, right, so even mistakes is yardage out. Son preciosos,vas a tener un quilt espectacular!